As allegations have surfaced that actor Kevin Spacey made a sexual advance on Star Trek: Discovery actor Anthony Rapp when he was just 14-years-old, Netflix has announced that it will bring House of Cards, its first original scripted show, to an end. Updates follow the post. The wording of that statement indicates that there is some concern that the cast or crew will feel uncomfortable working with Spacey. That could make filming the rest of the season... difficult. Netflix declined to answer any questions about the timing of its announcement. The Hollywood Reporter claims that the decision to end the show has “been in the works since the summer,” and according to TVLine, Netflix had not even officially confirmed that a sixth season had a green light. So, today counts as confirmation of a new season, and an announcement that it’s all over. The allegations against Spacey were made worse on Monday after his statement was met with criticism. In the course of two paragraphs, Spacey said that he doesn’t recall the incident in question but said if he did do what Rapp says, it was “inappropriate drunken behavior.” He then used the opportunity to pivot to an announcement that he is gay and coming out of the closet. Spacey implied that more stories could be fueled by his efforts to protect his privacy. GLAAD, the LGBT activist group, condemned Spacey’s approach saying “Coming-out stories should not be used to deflect from allegations of sexual assault.” Elsewhere, critics have accused Spacey of perpetuating a stereotype that associates gay men with pedophiles. This all marks an ignominious end for House of Cards. The David Fincher-produced show was the first of the streaming network’s original scripted offerings. Though it was technically a remake of a British show, it was a quite a different beast. On top of the relocation to a setting in US politics, the Netflix version brought big celebrities, glossy production, and a $100 million-per season budget. Its success kickstarted Netflix’s aggressive push to fill its service 50 percent original programming by 2018. Although the buzz-worthiness of the show has worn off considerably, it has been nominated for 53 Primetime Emmys since 2013, and according to The Motley Fool, as recently as June, it was the most popular television show on Rotten Tomatoes. Now, Netflix has a larger stable of programming and ending the show isn’t the end of the world. But it’s certainly a conundrum for executives to have to make decisions amidst such a scandal so early in filming. 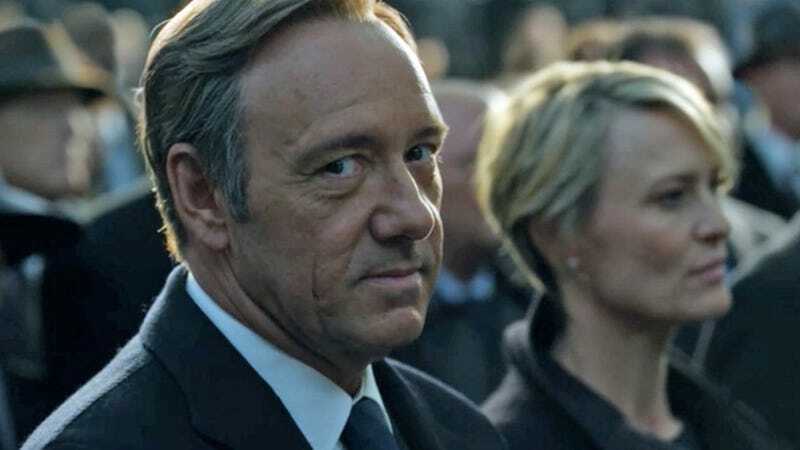 Does Netflix really want a big promo with Kevin Spacey’s face at the top of the page for several weeks next year? We’ve reached out to Spacey’s representative for comment but have not received a response.